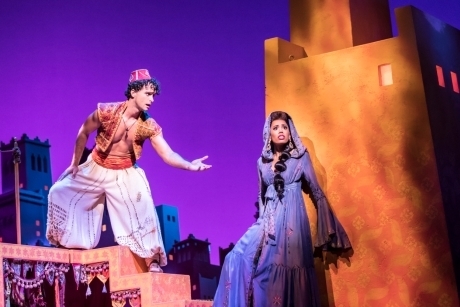 Disney’s hit West End musical Aladdin has launched a new video library to accompany its education programme. Nine short films have been made in consultation with teachers in order to help pupils prepare for their theatre experience as well as deepen their knowledge and understanding of the processes involved in theatre making. Aladdin’s curriculum-linked education resources are created for Key Stage 2 and 3, with workshops for pupils aged seven and above also available. The video library is hosted by Angellica Bell (The One Show, CBBC) and the videos feature exclusive new footage of rehearsals and interviews with both the show’s original creative team and the London cast and crew, which have been filmed in both London and New York. The videos will give teachers and students a new insight into Aladdin’s costumes, scenic design, music, characterisation, backstage crew, the ensemble, and more. To further enrich these resources, all episodes feature questions to spark debate and encourage further learning. Production notes and a practitioner profile for Bob Crowley, Aladdin’s scenic designer are also available. Performing Arts: Pupils gain knowledge of direction, concept, artistic vision and how meaning is communicated, collaborative working, and what jobs and roles are in the theatre industry. Art and Design: Pupils will learn how to source design ideas, and look at ways in which meanings, ideas and intentions can be communicated through design. All resources including the video library can be accessed for free at www.aladdineducation.co.uk. Teachers planning an accompanying visit to see Aladdin can take advantage of discounted tickets for educational groups of ten or more pupils. Educational workshops can also be arranged prior to watching a performance. School group tickets start at £19.50 and education workshops are £12.50 per pupil. (Photo credit: Johan Persson and Disney).